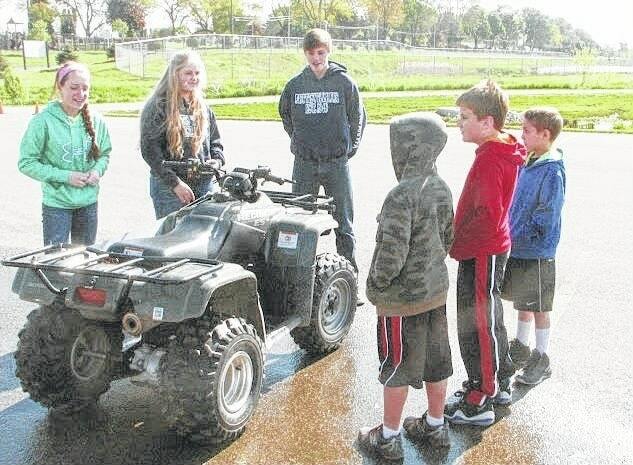 Gathered around an all terrain vehicle (ATV) in the south parking lot, students learn about ATV operating safety. On May 14, Pettisville FFA hosted a safety day for students to learn about farm safety. FFA members worked in groups throughout the school year to create a special banner regarding safety for a specific piece of equipment. On safety day, they gave presentations to both elementary and high school students with real equipment that was brought to the school parking lot. All fourth through twelfth grader students attended. Safety day was made possible by a grant from Dupont Pioneer. Pioneer also donated potato chips that were fried in their Plenish Soybean Oil. Dupont gave a presentation about how safety has always been important to their operations and ways that they practice safety when sampling grain bins. Culligan Water of Napoleon donated bottled water for students at the event.